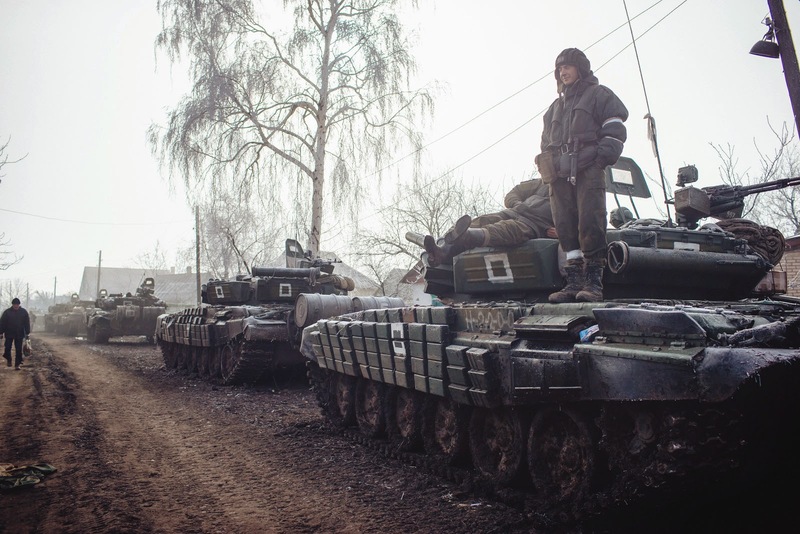 February 24, 2015 (Eric Draitser - NEO) - When the Minsk II agreement was officially announced on February 12, 2015, there was, for the first time in many months, a real belief that a cessation of hostilities was at the very least possible, if only conceptually. It seemed that the parties to the conflict finally had a framework within which they could move toward a peaceful settlement to end the dreadful war that has claimed the lives of thousands of innocent civilians in Donetsk, Lugansk, and surrounding areas. But perhaps this was simply wishful thinking. While the “Normandy 4” (France, Germany, Russia, and Ukraine) were negotiating the terms of the agreement, developments on the ground in Donetsk and Lugansk told quite a different story. Ukrainian forces continued their criminal shelling of civilians in Donetsk, while the anti-Kiev rebels continued sporadic fighting around Debaltsevo. Of course a war is always messy, and one cannot expect fighting to halt, or even necessarily decrease, while political leaders sit around the table. But the continuation of military hostilities was not the only issue. Rather, actions taken by Kiev’s military and fascist paramilitaries, in addition to their patrons in Washington, demonstrated that, rather than peace, the US-Kiev faction was interested in escalation. But how is this possible considering the string of defeats the Ukrainian military suffered at the hand of the rebels? Simple. Under the cover of media darkness cast by the shadow of the Minsk talks, the US and Kiev quietly connived to escalate the war and, simultaneously, violate multiple key provisions of the agreement. In effect, Minsk II was null and void the moment the clock struck midnight on Sunday February 15, 2015, the appointed time at which the agreement allegedly took effect. Although everyone was (and is) hopeful that the Minsk II agreement will lead to at least a temporary peace, the inescapable reality is that it is a political document designed for public relations, rather than a true agreement between equal parties. Moreover, Minsk II should be understood as the “peace” side of the Tolstoyan war and peace coin – a seemingly contradictory, but in fact quite complimentary, two-pronged approach taken by the US and its puppet regime in Kiev. On one level, the strategy is to bring negotiations front and center, highlighting the West’s so called “commitment to peace” as evidenced by the much vaunted jet-setting diplomacy of German Chancellor Angela Merkel. Indeed, Germany has much to lose given a continuation, and likely expansion, of the war in Ukraine; many in the German establishment correctly interpret the conflict as a proxy war between Washington and Moscow, a war in which Washington stands everything to gain, and Berlin everything to lose. And so, the view from Berlin was that Europe had gambled on Ukraine and lost, and that conciliatory negotiations had become paramount both to ease tensions with Russia, and to pull Europe back from the brink of a wider, and far more dangerous war. However, at the very moment that Merkel was seated across the table from Putin in Minsk, her partners in Washington were pursuing a decidedly different, and much more aggressive and dangerous policy. On Wednesday February 11, literally the very day that the Minsk talks were taking place, Reuters ran a story headlined U.S. army to train Ukrainians in March: commander U.S. army Europe which quoted U.S. Army Europe commander Ben Hodges as saying, “We will train [Ukrainian military] in security tasks, medical (tasks), how to operate in an environment where the Russians are jamming (communications) and how to protect (themselves) from Russian and rebel artillery.” So, at the moment that Western media were busily lauding Merkel and Hollande for offering an olive branch, US military officials were describing how Washington would be escalating the war. It is important to note that Hodges described the initial mission as training three battalions, but no specific limits in terms of time or manpower were presented by any US official. Presumably then, this escalation program would go on indefinitely, and would impact far more than simply three battalions. Moreover, a careful reading of the language of Hodges’ statement certainly should give anyone pause. For instance, what exactly is meant by “security tasks”? Does this include policing the streets of captured territory and/or Ukraine proper? It would certainly stand to reason considering the repeated warnings from President Poroshenko about possibly instituting martial law on the streets of Ukraine. Hodges’ declaration should be read as a carefully constructed statement designed to present the illusion that US military forces would be providing only “defensive” training and support. However, any serious political observer understands that such training will go far beyond simply teaching soldiers how to “protect themselves.” Rather, a more realistic interpretation of that statement would conclude that counterattack strategies and tactics are really the objective. Of course, Hodges is not the only one hinting at US plans. President Obama himself stated on the eve of the Minsk negotiations, “The possibility of lethal defence is one of those options that’s being examined…but I have not made a decision about that yet,” and that the US would consider “whether there are additional things we can do to help Ukraine bolster its defences in the face of Russian aggression.” Naturally, the phrase “bolstering defenses” is really just a politically acceptable euphemism, coded language for providing lethal weapons. Translation: the US wants to escalate the war by providing more material support to Ukraine in hopes of forcing Russia to respond in kind, then blaming Russia for precisely the escalation Washington itself initiated. So, on the one hand you have NATO allies Germany and France allegedly brokering peace, while the US foments war. While this should surprise no one who has followed the trajectory of the war in Ukraine, it does illustrate the degree to which US-NATO has come to accept the inevitability of a military defeat for Kiev. That is, unless the strategic calculus is altered significantly. In effect, the US killed Minsk II before any agreement was even reached. But, what of the agreement itself? Are the provisions even possible to implement and uphold? One of the key provisions in the text of the agreement relates to the presence of foreign elements and their necessary withdrawal. The agreement calls for, “Pullout of all foreign armed formations, military equipment, and also mercenaries from the territory of Ukraine under OSCE supervision. Disarmament of all illegal groups.” It stands to reason that the West and its puppet Poroshenko demanded this provision be included so as to immediately be able to cry foul on the rebels who Kiev has always maintained are “foreign terrorists” (regardless of whether they are Ukrainian or not). Indeed, the provision would require any volunteers from Russia, or those who have come from Spain, France, the US, and elsewhere to fight alongside the anti-fascist rebel forces, to withdraw from the territory. However, it is quite likely that Moscow agreed to this provision knowing that it is impossible for Kiev and Washington to live up to it. Why? Because US mercenaries have been operating inside Ukraine all along. According to German intelligence, at least 400 US mercenaries from Academi aka Blackwater, the infamous military/security contractor responsible for documented war crimes in Iraq and elsewhere, have been operating inside Ukraine from the very beginning of the conflict. Exactly what actions and/or crimes they might be responsible for is still unknown. However, their very presence inside Ukraine should raise eyebrows around the world, much of which has been inundated with the meme of “Russian aggression.” So, if Russian and other volunteers aren’t the only “foreigners” inside Ukraine, why is it that Russia is the only party being held up as a “foreign armed formation”? It should also be pointed out that this German intelligence report is only one snippet of information that was leaked to the German press. Typically, a leak indicates a far larger body of information. Who knows how many other US-NATO mercenary “formations” have been, and continue to be, involved in Ukraine? And this is precisely the point. The US is able to simultaneously say it is “considering” arming Ukrainian forces, while already having other forces on the ground. With one hand the US holds the knife to the throat, and with the other it holds the gun to the temple. So much for Minsk and diplomacy. While the politicians dance their danse macabre and talk of peace, withdrawal of heavy weapons, and demilitarizing the conflict, the US and its associated military and quasi-military appendages works diligently to escalate an obviously failed proxy war. In so doing, Washington undermines both the interests of its nominal European partners, and any prospects for peace. But of course, that’s precisely the point, isn’t it? The US is perfectly happy to pay its geopolitical tab in the currency of Ukrainian blood, while constantly pointing the finger at Moscow. But it’s not Washington’s fault, is it? The Empire is doing what empires do. It is the fault of all those in the media, both mainstream and alternative, who refuse to examine the evidence, who choose to reduce everything into simplistic black and white terms – they are the ones who must be held accountable. For the blood of innocents in Donetsk and Lugansk stains all. And those stains will never be washed away.